1 Blemished Available: $134.99 This item is available as a Blem/Refurb. These are items that cannot be sold as "New" merchandise and are limited to stock on hand. See the product details for a description of the product's condition. The Gerbing Hero Gloves are optimized for riders looking to push their riding season further in to the colder months of the year. 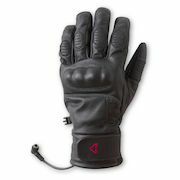 A premium Aniline cowhide leather construction with high impact knuckle protection, Aquatex breathable waterproof liner, 150g of Thinsulate insulation and a slim VELCRO® brand closure cuff keeps your hands uber warm and dry yet retains a sporty appearance that tucks neatly under your jacket cuff. Gerbing 12 volt is the global leader in powersport wearable technology. Using an advanced interconnect system, Gerbing garments plug right into your electrical system on your motorcycle, snowmobile, ATV, boat or even airplane for an unlimited source of power and keeps you warm at any temperature, any speed. A combination of Microwire heating technologies in conjunction with your electrical system enable Gerbing to put heat where others can’t and makes for the world’s warmest and longest lasting 12 volt platform, specifically designed for the temperature of speed. Note: Heat controller, Y-cable and battery harness sold separately. Bought them about 3 months ago and the right glove no longer heats up at all. Fabric between thumb and pointer finger is super tight and doesn't stretch. Even after ~3k miles. Fabric on the palm ripped easily and now I can't send for a warranty. When it worked, it was decent - now i just ride with a frozen right hand. Would not buy or recommend again. I purchased the gloves, the controller and harness all coming to about 200 dollars. I bit the bullet because I ride a motorcycle every day and thought these were the best on the market. Less than 2 months later the right glove has failed. Left glove still works fine. After calling revzilla they pawned off responsibly to Gerbing. Now that I am in contact with Gerbing they want me to pay for return shipping and want me to go buy a different pair of winter gloves to get me through the 30 degree temperature and the snow while they fix my gloves. When the heating worked it was great. I was honestly happy with the gloves. But after dealing with all these people who treat motorcycling as a hobby and don’t recognize it as a legitimate form of transportation I’m just going to stop doing business with revzilla and Gerbing. I noticed a big difference with these gloves. The colder it is outside, the less you notice the heat but you'll notice your fingers won't be cold and certainly not frost-bitten. Everything is great and you forgot about having spent $200+ with the controller included UNTIL they stop working. Mine just stopped working and it's only been a year! This is the 21st century, I mean, come on! I emailed customer service and still haven't gotten an answer from them. I learned that Gyde by Gerbing isn't the original Gerbing company as it was bought over. I guess the new owners don't have a good commitment to quality. One of the fingers also has a soft wear the material has come apart in a small section. I wish I never bought these gloves. We'll see if they're willing to fix or replace them which I doubt. I just received my Gerbing Hero Gloves. They are slightly tighter than expected, but I assume they will break in and fit just fine. I already have an old pair of Gerbings gloves - these Hero gloves are MUCH more comfortable! I also have Gerbings boot inserts and glove inserts. No doubt, all Gerbings products are high quality - expensive, but worth the money if you are hard-core and insist in riding in the cold (been riding in 10-degree weather, and the heated gear kept me plenty warm). Note that the video on these gloves states they come with the required "Y" harness - they do not. If this is your first set of heated gear, you need to buy the pigtail that attaches to your battery, a controller that plugs into the pigtail, and a "Y" harness to go from the controller to your gloves. Spring for the extra few bucks on the dual-dial controller/thermostat so you can separately control your gloves and another heated item (boot liners, vest, passenger's gloves, etc). Another suggestion - for most battery tenders, you can buy a connector that plugs right into the Gerbings pigtail. Get that and to make it easy to keep a fully charged battery on the bike in the winter (when you park, just plug the tender into the pigtail). a. the touch screen sensitive area is in the wrong location and not very "sensitive"
b. buyer beware: they are short, cold air will breach between glove and jacket. Not an issue above 40 degrees, but below it hurts. Fit is on the smaller side. I traded mine for the gauntlet version which took care of b. Except, the gauntlets are still a bit, how shall one put it, "skimpy." I had these for a couple of weeks and tested them in true winter conditions, in the rain, near freezing temperatures, at 60-70 mph, extended period of time, no hand guards, so direct exposure to the wind. They are truly amazing, I have not felt the wind, water or cold. Only complains I have, they are a bit bulky (or they may need more time to break-in), and the touch tip does not work very well (hard to use and innacurate). I’ve used these down to 20F with and without the heating on. Even without, they’re warm for 30-40 minutes. With the heat on, they’re warm forever. The leather is excellent, soft and pliable, and the gel through the palms is pretty good considering they’re winter gloves. They do run a tad small, so you should probably go up a size to be comfortable and leave a little air in the palm and fingers for insulation. Recently bought these while on sale. Good glove for $120. You definitely need a controller with these. Very hot on high heat. Comfortable when controlled. I just received these and have only used them twice on days where it was in the 40's and dry. So I can only speak as to how they work in that environment. I did not give them 5'stars because the do not heat the fingertips as well as the rest of the hand. Considering that is the first part of the hand to get cold you would think they focus a lottle more heat to that area. My hands were frikkin cold! Comfortable to wear... does the job on cooler days when I can ride during winter. Winters are cold in Korea, long ride to work and the gloves will help with the ride into work. Hands get the coldest when I ride even with my heated grips on my 2009 K1200LT BWM. Sytle, fit, function, comfort, and warmth. The revzilla video convinced me it was the one to go with. It has added protection. I like the non gauntlet style. It appears to be the least bulky which means I would probably wear it more often. It's a little pricey but I feel it will be worth it. . I needed something to warm my frigid fingers when ridding in the colder temps. This did the trick. I did have to go and buy the temp controller to use it though. In the end it was a great purchase. What's great about these is they do require a cable so batteries dying halfway through your ride is not a possibility. want to ride in colder weather but have warm hands. something i have not had in the 40 years i have been riding. These fit great and keep my hands toasty. Needed so I could drive to work in sub-50 degree (F) temps. Purchased these for a family member because #1 company reputation #2 the price and #3 they are compatible with his jacket.. I ride in pretty extreme winter conditions and these should make our rides much more comfortable. BEST ANSWER: The wiring is essentially identical to the older Gerbing gear. Most heated gear uses the same coaxial connectors. they can use the same adapter, the temp controller is only used for adjusting volt. Plugging them into the bike, can you use the same plug used for the battery tender? BEST ANSWER: If you use the converter, make sure you have a fuse in line. Otherwise, just add the Gerbing harness to the battery on top of the battery tender connection and have both. you need a converter from sae to coax(male) to use your battery tender jack. how many amps do the gloves draw? BEST ANSWER: 2.2 amp at 12v, ahout 1.1 amp for each glove. Whats the difference between the Vanguard and the Hero gloves by Gyde? BEST ANSWER: The Hero gloves which I have are intended to fit inside your sleeves. It's best then to wear a jacket with adjustable sleeves for a snug fit between the gloves and the jacket. The Vanguards are intended to be worn with the cuff outside your jacket. Hero has a shorter tighter gauntlet to fit under jackets cuff. Otherwise very similar. Will the gyde gloves work with the hotwired jacket and controller by sedici? Is the fitment closer to men's or women's sizing? The reviews state these are a little snug, but there's not a great frame of reference. Example: I tend to wear a men's small, but women's medium. I'm hoping these will be an improvement over my older, bulkier Gerbing gloves, and will make it easier to operate the controls on my various bikes. BEST ANSWER: The sizing with gloves is always a challenge. I wear 2XL, and wanted a pair for my wife also, so purchase her men's medium (she's not a big girl, but has large hands for her size). The gloves are a little bulky on her, but do keep her warm. We ride two up so that's not such a big deal for her. If she was riding herself however, I think men's small would be a better choice. I personally don't find these to be overly bulky for a heated winter glove. BEST ANSWER: The gloves do NOT come with the "Y: harness. And yes, you will need a thermostat, controller, otherwise they constantly run at full power. These things get plenty hot and you cannot tolerate them at full power! Recommend a 2-knob controller. Once you get the gloves, you will likely want more heated gear. I have the boot inserts to keep my toes warm - many others have the heated vest or jacket. You can control multiple accessories with a one-knob controller, but that means they all are at the same setting; a 2-knob controller allows you to adjust each separately. No these are hard wired. You also need a controller. I have a wireless dual controller that lets me control the heat separately for my jacket and gloves. The gloves plug into my jacket selves and the jacket plugs into the bike. I placed a jack for it under my seat. I believe the gloves do come with a y harness cable in case you don't have a wired jacket. But you do still need to buy a controller. These gloves are now in that they heat both the palms and tops of your hands. These ones don't have a battery, but you can get ones that do. I've been riding with the Gerbing gloves for at least 5 years, honestly don't notice the cables. I do notice the temperature controller though (you have to buy that separately), although the comfort of the gloves more than makes up for hassle of the controller. I also use the heater jacket liner which makes the cabling easier. No charging, no battery. They plug into the connectors on your Gerbing heated jacket, which in turn is plugged into your bikes battery. If I am just going to connect this to my battery tender, what other cable do I need? BEST ANSWER: The connection is different from the battery tender connector. I routed mine from my battery to right under my seat so I can plug in basically right by my crotch. It seemed like a good location. It was a simple five minute job. No - these gloves do NOT come with the battery harness or "Y" connector, or controller. You need to purchase each of these to use the heated gloves. All Gerbing heated gear comes with a battery harness. Only other thing you need is a temperature controller. I'd recommend a dual wireless. How do these perform in the rain? No rain experience yet, but they wonderful on the cold days. With heat supplied to back if fingers, hands stay toasty. Very quality build. Really don't have a clue. Only ridden in cold weather this past winter. Do these heat on the top of the hand as well as the palm ? BEST ANSWER: There are wires all around, top, palm, and fingers, even the top of the fingers.